After being a mom for almost 9 years now, I want to be ready for whatever happens. And that usually means planning for the worst. As parents we don’t want to see our children in pain and usually take every precaution to avoid it. I usually have a pretty good grasp on when my kids aren’t feeling well and like to try and solve the problem at home before heading off to the doctor prematurely. Sometimes, though, it can feel like overkill giving my kids medications and I always try to keep an open mind that there might be a less invasive or alternative approach to helping them with whatever is bothering them at the time. Recently, I’ve started hearing more and more about essential oils and how life changing they’ve been for one family I know. One friend literally has an oil for everything and if she doesn’t know what oil will help in whatever situation she needs it, she’ll start researching and find one that will. I appreciate that my friend wanted to help by introducing me to essential oils and while I truly do love the idea of essential oils, I felt completely overwhelmed by it all. Not just what oil I needed for the issue I was trying to help, but how to mix oils to get the right combination or dilute them or diffuse them. With a learning curve on using essential oils, I had pretty much given up on the idea of ever figuring them out. And I have to admit that I had become a bit of a skeptic about using essential oils at all. So when Oilogic reached out to introduce their product line of essential oils safe for kids and sponsor this post, I wasn’t entirely sure how it would turn out. But I would do anything for my girls and was anxious to see if this was a new way to help them feel better, even when they’re not officially sick. If traditional essential oils confuse you, you don’t want to pay an arm and a leg for them, and want to ensure they’re safe for your kids then Oilogic is the brand for you. Oilogic has introduced a new way for parents to help care for their kids. They use 100% pure essential oil in their products and then dilute it to the appropriate ratio for babies (6+ months), toddlers, and kids. The roll-on applicators makes using Oilogic super easy and perfect for squirmy kids without worries of oil leaking all over the place. Plus, these heavenly scented products are clean, natural, and free of the following: petroleum, phthalates, parabens, sulfates, gluten, dea, dyes, mineral oil, artificial colors, and synthetic perfumes. Applying is easy: just roll on a generous amount of Oilogic oil to your child’s chest, back of neck, and the bottom of the feet and allow the vapor and the oils so take effect. Then, just reapply as needed. The Bug Bites & Itches can be applies directly to the affected areas. 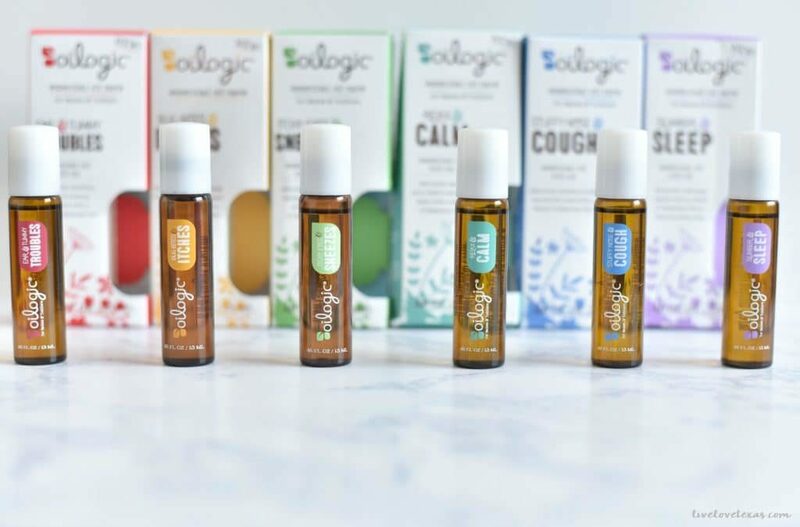 While I’m not over my intimidation of essential oils, Oilogic’s line of essential oils safe for kids definitely gets my vote as far as the quality of the product, price, and ease of use. Fortunately they haven’t been sick or needed to use most of the essentials oils…yet but with back to school here and fall just around the corner and our second allergy season on the horizon, I know we’re going to need them. After some bad side effects from prescription and over-the-counter allergy medications in the past, I’m excited to try these oils to see how they help the girls’ symptoms. So far we really like the Relax & Calm and Slumber & Sleep and when it’s applied, the girls feel like they’re putting on perfume. And I don’t plan on telling them otherwise. If you’re not ready for the roll-ons or are just looking for a little extra help with getting your kids to go to sleep easier at night without dozens of trips to the bathroom, Oilogic also has a line of personal care products such as baths, creams, and soaks as well. Oilogic are essential oils safe for kids and available in Texas at your local H-E-B, online at OilogicCare.com, or use this store locator to find other stores near you carrying the brand. You can learn more about Oilogic on the brand website or by following them on Twitter, Facebook, Pinterest, and Instagram. Are there any other essential oils safe for kids first aid kit ideas that I should add to my collection?